Articles about pottery, programming, and everything else that Donnie gets up to. I don't know what started my interest in flameware. Maybe it's the fact that pottery is frequently used with food, in the guise of coffee cups, serving bowls, trays, plates, and so forth! What potter wouldn't want to take the next step and bake a nice loaf of bread in a ceramic loaf pan, or better yet, slip a nice crock of macaroni and cheese under the broiler to produce a wonderful cheesy delight? Many potters who work with stoneware are already willing to use their ceramics in the oven, as long as they follow certain rules: Don't put the pottery in a hot oven! Don't heat empty pottery! Never use the pottery on the stove or under the broiler!! But, flameware clay is supposed to allow you to do all these things. Flameware clay is designed to endure use over an open flame. 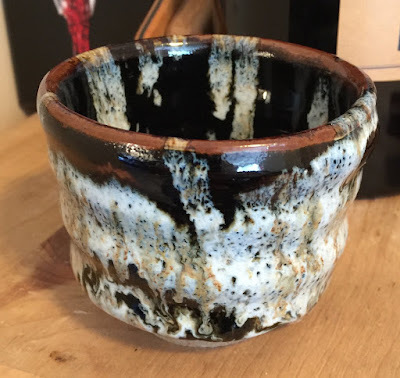 In this post I hope to enumerate the resources I have found on the Internet about flameware clay, as well as describe our first tests with a flameware clay body. Crater glazes are fascinating. Not terribly functional, but some of the effects you can get are really beautiful, especially when you can expose multiple layers of color on your pottery. Here is a link to a page with a few photos, or just search for "crater glazes" on the Internet! Once I saw this technique, I really wanted to start experimenting with it so that I can use it in my own pottery. I [re]created this blog back in 2014, when the server in my office crashed and I no longer had local computing resources to use. So, I decided to switch over to hosted services, specifically Google Mail for donniepinkston.net mail services, and Blogger for my blog. I only had one problem - all the interesting programming topics that I wanted to write about, ended up being problems in assignments and exams for my classes! So, I really didn't have a whole lot to write about. Fortunately, I have been developing another addiction besides programming, and that's ceramics. And thankfully, there are a lot of fun and interesting technical challenges that are worthy of discussing on a blog. Not to mention posting pretty pictures of all the things I make! So, that's what I am going to start using my blog for. If I do come across interesting programming topics that are worth sharing (and that don't give away answers for a class) then I'll definitely include them, but for now, my posts will primarily be ceramics related.